The historic 1928 "Bunion Derby" was a cross-country footrace from Los Angeles to New York City. In a supreme test of human endurance and fortitude, runners pounded the pavement for 84 straight days, covering more than 3,400 miles. Starting in Los Angeles, the competitors tracked the path of old Route 66 to Chicago. From there they followed a twisting 1,000-mile trail to New York City. That journey is the subject of this book. While previous books and articles have been written about the race, most have concentrated on the promoter, C. C. "Cash and Carry" Pyle, his runners, or the Route 66 portion of the race. 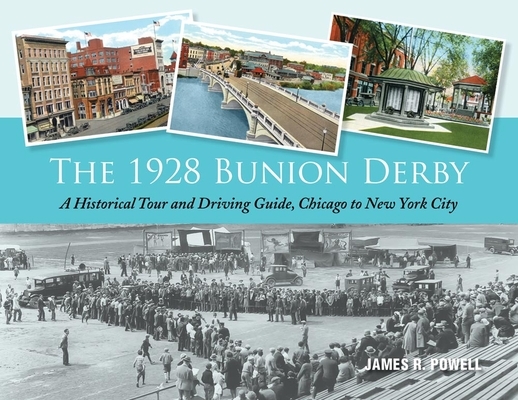 In The 1928 Bunion Derby: A Historical Tour and Driving Guide, Chicago to New York City, author James R. Powell takes a more robust approach--including a turn-by-turn driving guide from Chicago to New York with historical background on the route and the racers. Powell not only portrays the runners and the intensity of such a race, but also explains important events that transpired in the years leading up to the Bunion Derby. His historical tour describes surviving sites along the route and offers stories reminiscent of American life in the late 1920s. More than 200 illustrations--including period photographs, postcard images, and maps--enliven the story of this landmark race. The 1928 Bunion Derby is highlighted by tales of the torturous path runners followed to reach each overnight stop. And reports from period newspapers add color and a sense of the moment to the historic images and stories, both harrowing and heartwarming. A glimpse back in time, with a look at the places along that historic route today and a description of how to get there, The 1928 Bunion Derby has something for everyone--from historians to runners and from road warriors to armchair travelers.